Tickets from £26.75 Includes service fee and £1.20 facility fee. A £2.55 admin fee applies. The Award Winning Brendan O’Carroll and Mrs. Brown’s Boys are in the midst of their brand new production “Mrs. Brown’s Boys D’Musical?” coming to Birmingham in June. 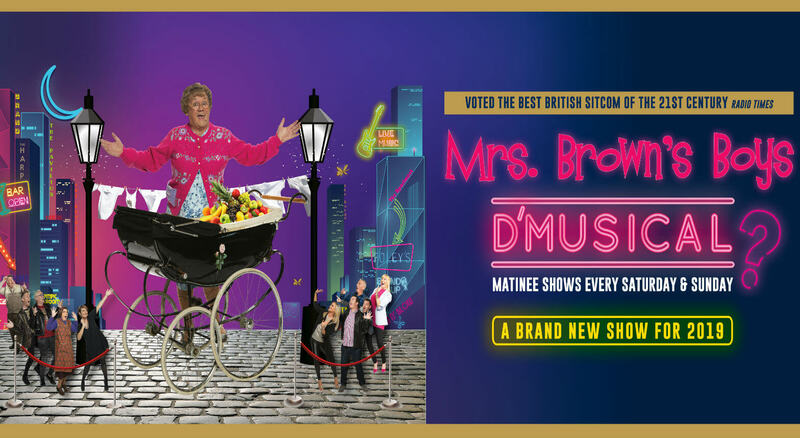 If you haven’t experienced Mrs. Brown’s Boys live show, this tour is set to be one of the hottest tickets for 2019 and is not to be missed! Mrs. Brown's Boys is a television sitcom created by and starring Irish writer and performer Brendan O'Carroll and produced in the United Kingdom by BBC Scotland in partnership with BocPix and RTÉ. O'Carroll himself plays his drag persona, Agnes Brown, with several close friends and family members making up the rest of the cast. The show adopts an informal production style where production mistakes and tomfoolery, mostly instigated by O'Carroll, are edited into each episode. Despite being lambasted by critics, the show has become a ratings success in both Ireland, where it is set, and the United Kingdom, where it is recorded. It is also gaining increasingly higher ratings in Australia and Canada. The show has won numerous awards.